Staff photo by Steve Muscatello New Ulm Cathedral’s Alex Hillesheim (left) guards Minnesota Valley Lutheran’s Jake Kettner (12) as he takes a jump shot durign the first half Friday at MVL. Hillesheim scored his 1,000th career point during the game. 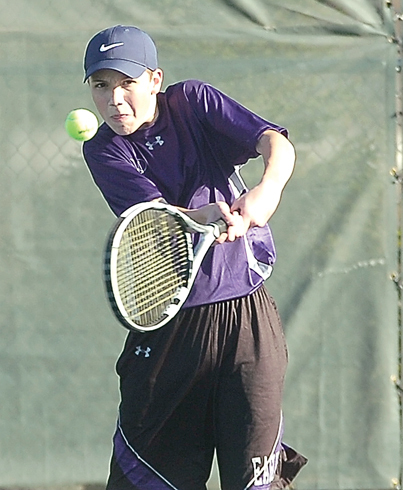 NEW ULM — New Ulm Cathedral might not be able to win the Tomahawk Conference boys’ basketball race, but that doesn’t mean that they still can’t affect the outcome. The Greyhounds rode hot shooting from 3-point range (they hit 14-of-22 from 3-point range) and the leadership of Alex Hillesheim to defeat Minnesota Valley Lutheran 94-87 on Friday night. Hillesheim scored his 1,000th career point with 15:53 left in the first half and he continued to be the hot hand, finishing with 28 points. Chris Knowles had 21 points and Jon Zinniel finished with 16 for the Greyhounds. James Gillis (14 points) and Ethan Kirchberg (13 points) also hit double figures in the balanced attack. For Hillesheim, it was a good night, earning both the milestone and the victory. 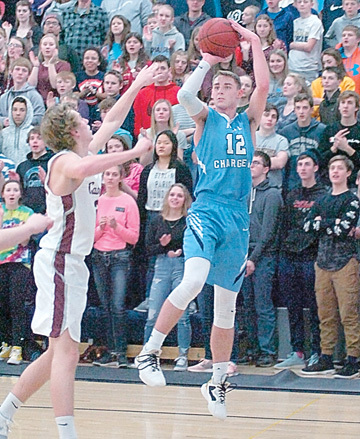 Jake Kettner scored 28 to lead the Chargers, who shot 43 percent from the field compared to 61 percent for the Greyhounds. Mason Cox and Izayah Harrison each scored 12 while Dunwa Omot and Matt Munsen finished with 10 apiece. “We didn’t shoot the ball very well, but then on the other hand they shot pretty well and capitalized on it,” MVL coach Craig Morgan said. It was only the second loss of the season for the Chargers (18-2, 10-1) and their first conference loss. Their last loss was in the Bethany Lutheran Tournament against Fairmont. On Friday, Morgan said his team struggled, similar to that Fairmont game. “When lost our game against Fairmont, we didn’t run our offense and we sat around and just watched other people just taking one-on-one,” Morgan said. The Greyhounds jumped out to the early lead, going up 30-15 at one point. But the Chargers stormed back, and they trailed 32-25 with 4:14 left in the first half. Cathedral led 37-27 at the break. Any MVL comeback attempt was ruined when Cathedral came out hitting 3s in the second half. The Chargers hit their first six attempts from outside in the second half. The Greyhounds stretched the slim lead into double digits and it stayed that way a majority of the second half. They held on with free throws at the end. Cathedral (15-4, 9-4) hosts Buffalo Lake-Hector-Stewart on Tuesday and MVL travels to Springfield for first-place bragging rights in the Tomahawk on Tuesday.